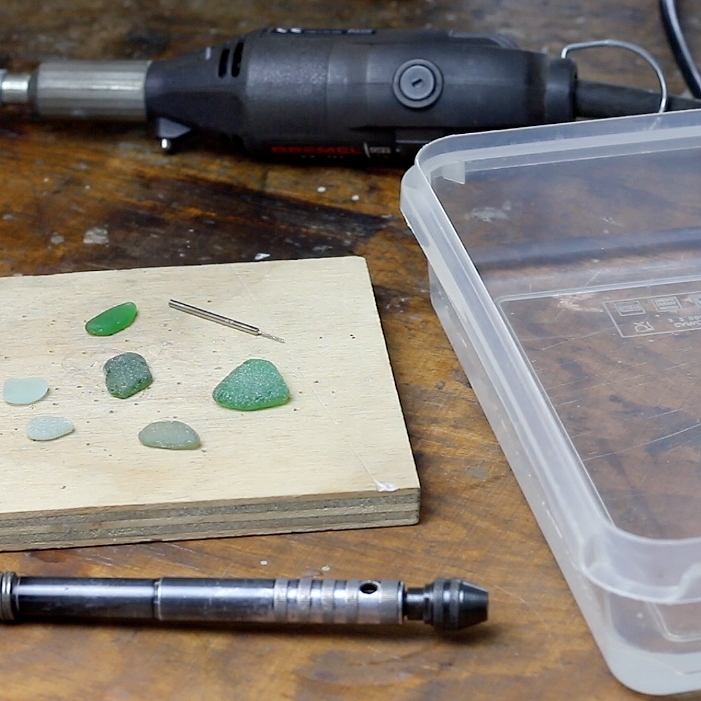 How to drill sea glass is one question we get asked a lot! So we thought we'd show you how it's done. You'll find a video tutorial of how to drill a piece of sea glass using a drill bit and how you can easily transform it into a necklace. Follow our top tips and get all the supplies you need right here on our website. 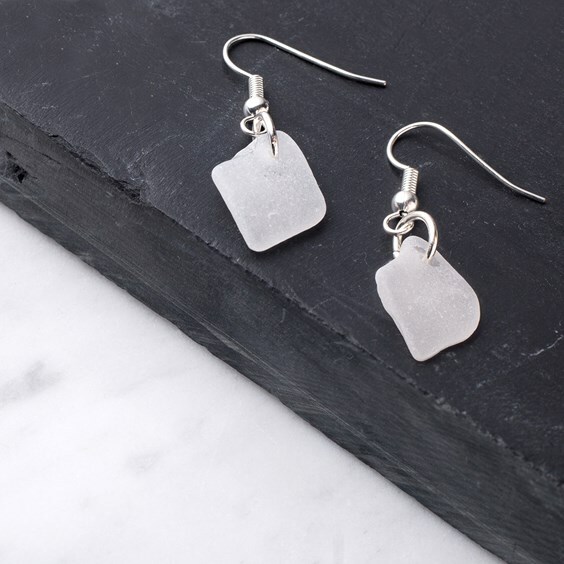 Don't forget to tag us on social media in your sea glass designs, we often share our favourite designs! Find us on Instagram, Facebook and Twitter. Assess safety in your workspace, such as wearing safety goggles and ensuring the electric parts of the rotary tool is away from the water. 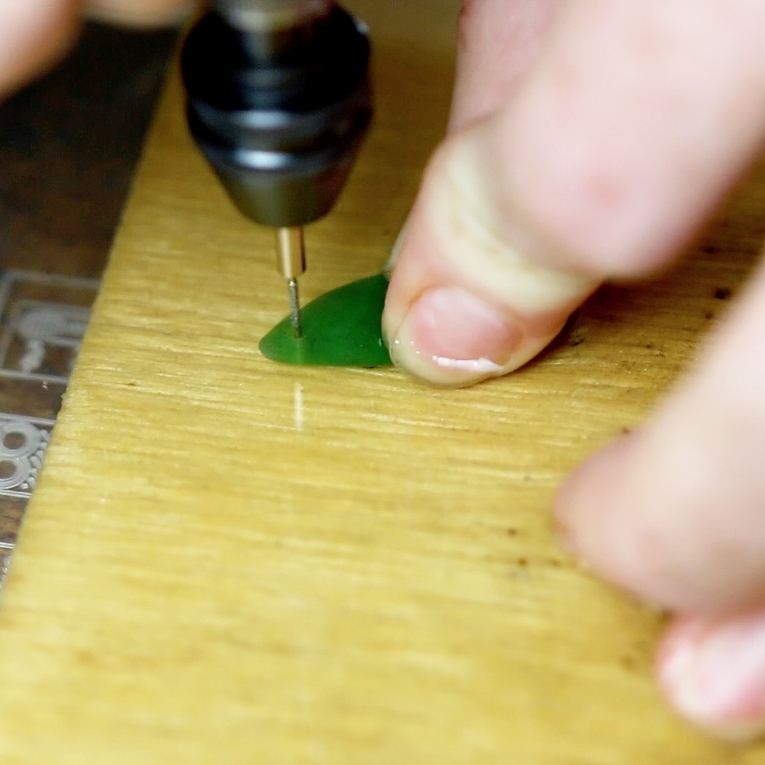 Begin drilling the sea glass at an angle as this will stop the drill bit from skidding out of position. Use light to medium pressure, allowing the diamond coated drill bit to go at its own speed. Use plenty of lubrication and rinse the sea glass regularly. Keep the drill bit and sea glass cool throughout the drilling process. For thick pieces of sea glass, you can drill 3/4 of the way through, flip it over and drill from the other side for a more even hole. Be patient - if you break some pieces of sea glass or a drill bit, don't panic - assess your technique and try again. This rotary tool is perfect to use alongside our diamond coated drill bits. 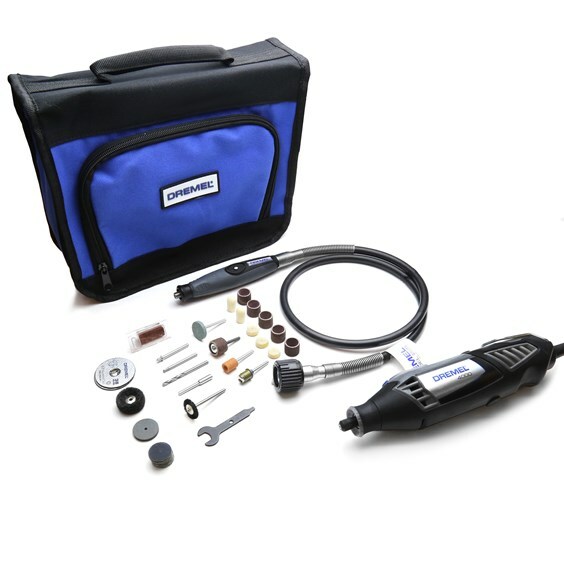 The Dremel 4000 Multi-Tool is great for both hobbyists and dedicated jewellers, used for drilling, sanding, carving, engraving, cutting, grinding, cleaning and polishing. You will also need a multi chuck to use alongside the Dremel 4000 Multi Tool and diamond coated drill bits. Diamond coated drill bits are essential for drilling sea glass, stones, sea glass pearls or ceramics. They must be used at a slow speed and water must be used as a lubricant. They are available in a range of diameters to suit your needs, in this project we've used a 1mm diamond coated drill bit. Insert the diamond coated drill bit into the collet and tighten. Ensure that the rotary tool is in a safe position, clear from the water. Place the wooden board into the tub with shallow water - the board is to stop the drill bit going through the tub. 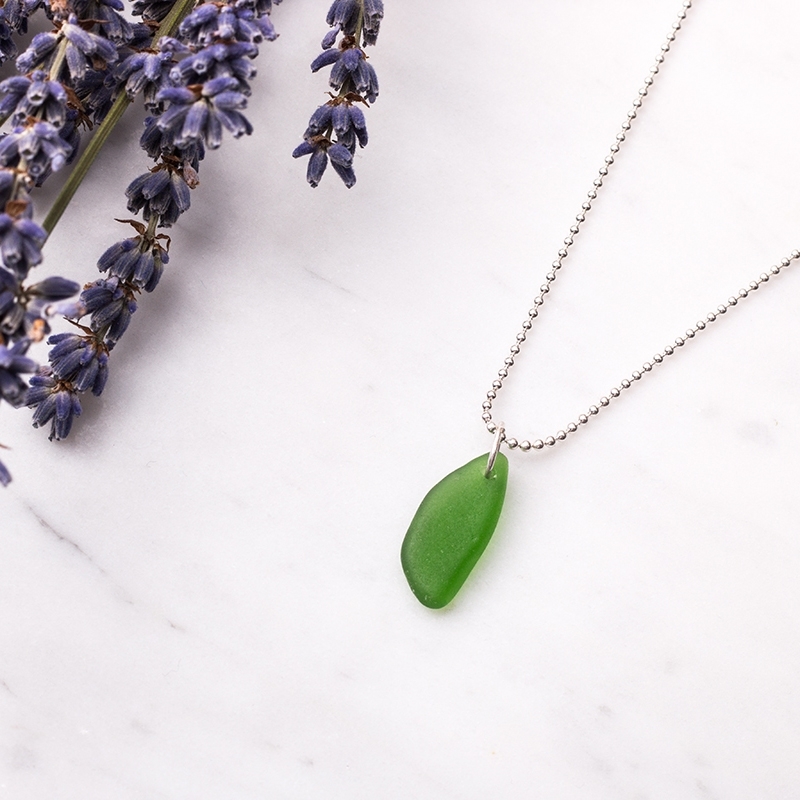 Place your sea glass on top and ensure that there is enough water to cover the board and sea glass. The sea glass needs to be drilled in water to avoid the sea glass and drill bit from overheating and to keep the hole clear. 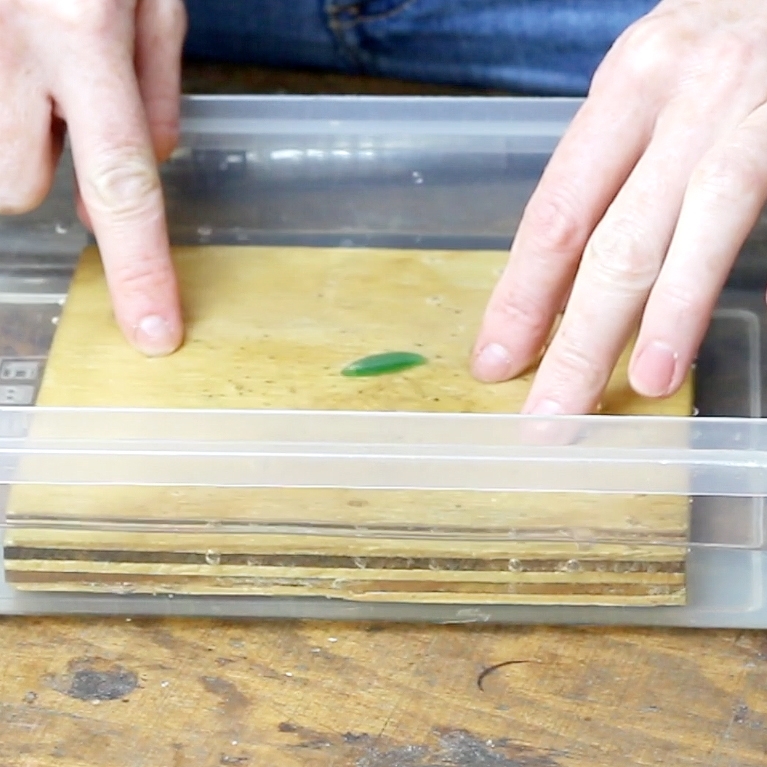 Set the speed of the rotary tool to low, use your finger to hold the sea glass under the water. Begin drilling at an angle - this will stop the drill bit from skidding out of position). Then continue to drill vertically using light to medium pressure, allowing the drill bit to go at its own speed. Use a pulsing technique to keep the sea glass and drill bit lubricated, allowing the water to reach the tip and wash away debris. Rinse the sea glass frequently to keep it cool. Using a good drilling technique and having lots of lubrication will improve the life-span of the drill bit quite considerably. So you've drilled your piece of sea glass, now what? You can transform it into a pendant, charm or use for dangly earrings! The example we show is a simple necklace - it's so easy! 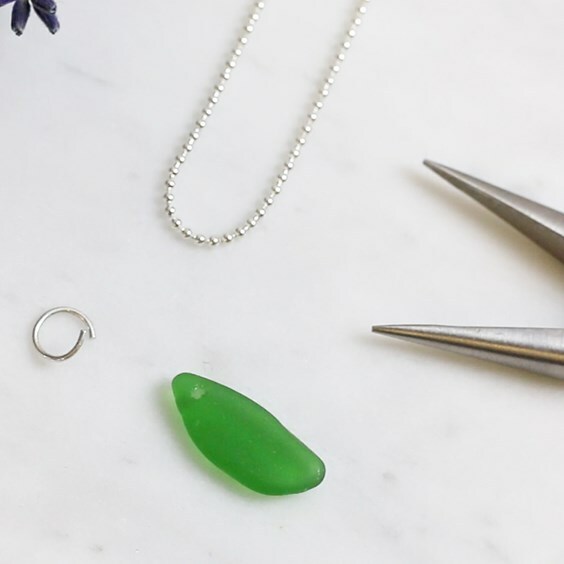 Simply get the appropriate size jump ring for your sea glass to attach through the hole, take this into consideration when drilling the hole as the closer you are to the edge, the more room you will have for the jump ring - 7mm jump rings work well for this. In this project, we've used 1mm diamond coated drill bit and If your jump ring doesn't fit, you could also use a wire wrapping technique to form a loop - find step by step instructions here. Read our top tips for opening and closing jump rings correctly here. You will need snipe nose pliers.